Interpret the lead MCL-1 rhythm strip shown in Figure 1. Can you explain the irregularity? Figure 1 – Right-sided MCL-1 monitoring lead rhythm strip. Can you explain the irregularity? (Figure reproduced from Section 19.0 of ACLS-2013-ePub). – NOTE – Enlarge by clicking on Figures – Right-Click to open in a separate window. INTERPRETATION: The easiest way to approach interpretation of challenging arrhythmias is to start with what is known. Save more difficult parts of the tracing until later. We always look first to see if there is an underlying rhythm. In Figure 1 – the underlying rhythm is sinus, as determined by beats #1, 3, 5, 7, 9, and 11 which are all preceded by a similar-morphology biphasic P wave with fixed PR interval. All QRS complexes except for beat #4 are narrow. Note the interesting bigeminal periodicity of the rhythm – with alternating short-long cycles. Thus, every-other-QRS complex occurs early. Every other QRS complex is a PAC (Premature Atrial Contraction = Figure 2). Figure 2 – Adding arrows facilitates recognition of multiple PACs (See text). P wave morphology of each PAC in Figure 2 (red arrows) is slightly different in being primarily positive compared to the biphasic P waves of each sinus beat. This is as it should be since PACs by definition originate from a different site in the atria than the sinus node. Not all PACs in Figure 2 are conducted. Note that no QRS complex follows the PACs that occur just after beats #2, 6, and 10. 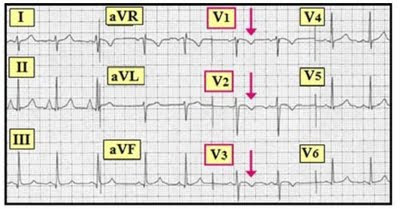 These PACs are “blocked” (nonconducted) – because they arise so early in the cycle as to occur during the ARP (Absolute Refractory Period) when conduction to the ventricles from an impulse arriving early at the AV node is not possible (See ECG Blogs #14 and #15 for Review of this concept). Whether blocked PACs also occur and are hidden within the ST-T wave of beats #4 and 8 cannot be determined with certainty from Figure 2 – but the slight ‘blip’ near the beginning of the ST segment of beat #4 suggests that this may be the case. 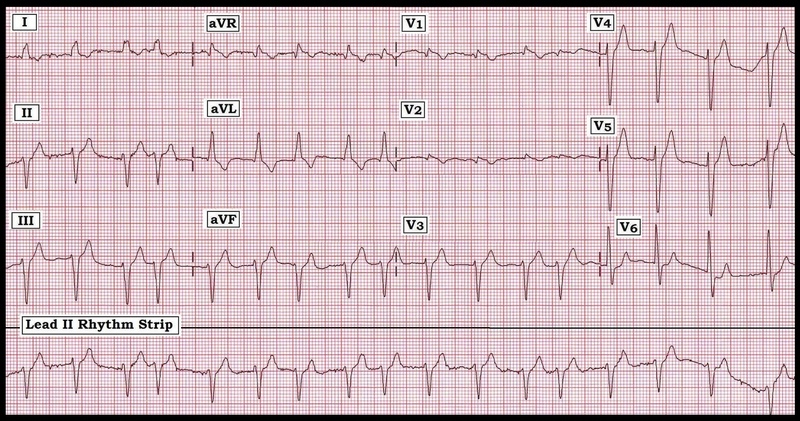 The widened QRS complex in Figure 2 (beat #4) is not a PVC (Premature Ventricular Contraction). Instead – it too is a PAC conducted with aberration. Note that beat #4 is also preceded by a premature P wave (red arrow before beat #4) – which confirms that this beat is an aberrantly conducted PAC. In fact – beats #2, 4, 8 and 10 are all aberrantly conducted PACs! Normally – QRS morphology of PACs will be virtually identical to QRS morphology of sinus beats. PACs merely arrive earlier than anticipated at the AV node – but once there, they typically conduct to the ventricles in normal fashion. It is only when PACs arrive especially early (or when the relative refractory period is for some reason prolonged) that PACs may manifest aberrant conduction. Beats #2, 4, 8 and 10 are all PACs that manifest different degrees of aberrancy. Of these beats – it is beat #4 that manifests the greatest degree of aberrant conduction (in the form of a complete right bundle branch block pattern). This makes sense because the coupling interval of the PAC preceding beat #4 (distance between this P wave and beat #3) is shorter than the coupling interval for the other PACs. The P wave preceding beat #4 therefore arrives earlier at the AV node at a time when it is more likely to encounter the conduction system in a relatively refractory state. In contrast – the coupling intervals of the P waves following beats #2, 6 and 10 are even shorter. Physiologically, the P waves following beats #2, 6 and 10 are presumably occurring during the absolute refractory period, which is why these PACs are “blocked”. Beat #6 does not conduct with aberration. Measurement with calipers shows its coupling interval (from the P preceding beat #6 until beat #5) is slightly longer than the coupling interval preceding premature beats #8 and 10 (ergo slightly more time for recovery and therefore more normal conduction of beat #6). - See ECG Blogs #14 and #15 for Review on Aberrant Conduction. Interpret the rhythm strip shown in Figure 1. The widened beats on the tracing are not ventricular. What else might they be? Why might beats #4-thru-7 be wide? (Figure reproduced from Section 19.0 of ACLS-2013-ePub). INTERPRETATION: The rhythm strip in Figure 1 shows the rhythm to be irregularly irregular in this right‑sided MCL-1 monitoring lead. No P waves are seen – so that the underlying rhythm is atrial fibrillation. Fine undulations in the baseline represent “fib waves”. The interesting part of the rhythm strip is intermittent widening of the QRS complex. Although at first glance one might be tempted to interpret the run of widened beats (beats #4-thru-7) as AIVR (Accelerated IdioVentricular Rhythm) — subsequent rhythm strips proved this not to be the case. AIVR is often an “escape rhythm” that arises when the patient’s underlying rhythm slows. AIVR is typically (although not always) a regular rhythm. In contrast to this – the widened beats in Figure 1 do not manifest the delayed timing of escape beats, nor is the run (beats #4-thru-7) regular. It is admittedly difficult to be certain of the diagnosis of rate-related BBB from inspection of the single rhythm strip shown in Figure 1. That said, the important point is to be aware of this entity – since it helps to explain why the run of widened beats in Figure 1 is not AIVR or NSVT (NonSustained Ventricular Tachycardia). In support of the premise that the widened run in Figure 1 represents rate-related BBB – QRS morphology of these widened beats 1 is consistent with the predominantly negative QS or rS complex expected in right-sided lead V1 when LBBB (left bundle branch block) is present. Rather than two competing rhythms – the overall irregular irregularity of the rhythm suggests that all beats seen represent atrial fibrillation. Rate-related BBB characteristically begins when heart rate speeds up. In atrial fibrillation – it is typically seen following a longer R‑R interval, since the relative refractory period of the next beat is dependent on the length of the preceding R‑R interval. Close inspection of Figure 1 reveals that beat #3 is slightly widened. This beat follows a longer R‑R interval (the R‑R between beats #1-to-2). Thus, beat #3 actually represents the onset of LBBB-conduction in this tracing (albeit with a less complete form of LBBB given its lesser degree of QRS widening). The run of rate-related LBBB conduction continues until beat #8 when the rate of atrial fibrillation slows. Beat #11 at the end of the tracing represents a final widened beat that manifests LBBB‑conduction as a result of its short coupling interval with beat #10. FINAL THOUGHTS: Subsequent rhythm strips on this patient proved beyond doubt that LBBB conduction consistently occurred during periods of more rapid atrial fibrillation – and consistently resolved soon after the rate slowed down. Of interest (and further complicating diagnostic recognition of this important but uncommon phenomenon) is the fact that: i) the rate of onset of BBB conduction is often not the same as the rate where normal conduction resumes (ie, rate-related BBB may begin when heart rate exceeds 90 or 100/minute – but normal conduction may not resume until heart rate goes back down to 80/minute or less); and ii) AIVR is not always a precisely regular rhythm (making it more difficult to determine when irregular widened beats represent AIVR vs atrial fibrillation with rate-related BBB conduction). - See also ECG Blogs #14 and #15. The ECG shown below was obtained from a 63 year old man with chest pain. How would you interpret his tracing and accompanying lead II rhythm strip? What is there to worry about? Figure 1 – 12-lead ECG and lead II rhythm strip from a man with chest pain. – Right-Click to open in a separate window. INTERPRETATION: There is a lot to be concerned with on this tracing. The rhythm is irregularly irregular at an average rate of more than 100/minute. Although there are fine undulations in the baseline, no definite P waves are seen in the lead II rhythm strip at the bottom of the tracing. Thus, the rhythm is atrial fibrillation with a fairly rapid ventricular response. The QRS complex is clearly wide. QRS morphology in leads V1 and V6 is consistent with a bifascicular block pattern of RBBB (Right Bundle Branch Block) with LAHB (Left Anterior HemiBlock). However, the monophasic R wave in lead I is not consistent with RBBB, but rather with a LBBB (Left Bundle Branch Block) pattern. Description of QRS morphology in this tracing might therefore better be classified as IVCD with LAD (IntraVentricular Conduction Delay with Left Axis Deviation). NOTE: The basics of assessing ECGs for the presence of RBBB, LBBB, and IVCD were covered in ECG Blogs #3, #11 and #13. We review this entire subject in our ECG Video on the Basics of BBB. In view of this patient’s presentation (ie, chest pain) – the most important finding on this tracing is the subtle appearance of Q waves with slight but definite ST segment coving and elevation in leads V1 and V2. T wave inversion in these two leads is an expected accompaniment of RBBB – but the ST segment elevation is not. At times, a QR rather than RSR’ complex may be seen in lead V1 with RBBB – but a Q wave will usually not be seen in both leads V1 and V2 with RBBB unless there has been infarction. Detection of acute myocardial infarction is always more challenging in the presence of a conduction defect. This is especially true with LBBB, since infarction Q waves are rarely written, and ST-T wave changes will often be masked by the underlying LBBB. Recognition of acute ischemia or infarction is still challenging in the presence of RBBB, but the findings seen in leads V1 and V2 of this tracing in the setting of new-onset chest pain should suggest the possibility that acute infarction may be occurring. Clinical correlation and comparison with a prior tracing on this patient would help clarify if the findings in leads V1 and V2 are new or old. ADDENDUM (3/24/2018): In response to the Question by MG (See below), I am writing this Addendum. On review today of this post (that I wrote nearly 7 yerars ago, back in 2011 … ) — I would add the possibility of a Brugada pattern in leads V1,V2 accounting for the ST-T wave appearance in these leads. Problems in knowing for certain what is happening are: i) The very atypical QRS morphology, that is not fully consistent with either RBBB or LBBB; ii) the very small amplitude of the QRST complexes in leads V1,V2; and iii) My lack of clinical follow-up of this case. What I can say, is that the small QR complexes in lead V1,V2 + the wide terminal S in lead V6 are consistent with RBBB and probable anteroseptal infarction at some point in time. Whether the small amplitude ST segment elevation with downsloping into T wave inversion that is present in these leads represents recent infarction — vs a Brugada pattern — (vs some combination of the 2) — I think is impossible to be certain of given the above limitations. Many factors may be associated with an ECG pattern known as “Brugada Phenocopy” (See https://youtu.be/h1MhtLMF-7M?t=9m17s ) — and close clinical follow-up would be needed to determine whether this might be present here. Along the way, I’d still want to rule out the possibility of an acute event in this patient with new chest pain. My THANKS to MG, for his astute question on this case. Interpret the 12-lead ECG shown below in Figure 1, obtained from a 72-year-old woman as a “baseline tracing”. What type of “block” and what kind of “early” findings do you see? Is there evidence of recent infarction? Clinically – What would you do? NOTE: Parts of our answer to this very interesting tracing are advanced. That said – I think there are lessons to be learned for all levels of interpreters. Are you up for the challenge? Figure 1 – 12-lead ECG obtained as a “baseline” from a 72-year-old woman. What type of “block” do you see? What to do? INTERPRETATION: The underlying rhythm for the 12-lead ECG shown in Figure 1 is sinus, as confirmed by the upright P waves with fixed PR interval for the 2nd and 4th beats in lead II. There is variability in the overall ventricular response, in part due to sinus arrhythmia and in part due to the 3 PACs (Premature Atrial Contractions) that are seen on the tracing. Lack of a lead II rhythm strip makes it more difficult to identify these rhythm characteristics. We’ve therefore labeled the 14 beats in this tracing (Figure 2). 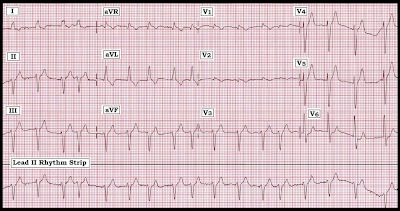 Figure 2 – 12-lead ECG from Figure 1 with each beat and key findings labeled. The 3rd beat (seen in simultaneously recorded leads I,II,III ) is a PAC. The premature P wave is well seen notching the preceding T wave in leads II,III (small red arrow in lead III ) – but not seen in the small amplitude QRST complex of lead I. This emphasizes one benefit of assessing rhythms in more than a single lead – which is that some leads are better than others for identifying certain findings. Beats #7 and #11 are also PACs (Note small red arrows highlighting the premature P wave in leads aVF and V1,V2,V3). We would need a longer rhythm strip to determine if the pattern seen here (every 4th beat being a PAC) continues – in which case the rhythm would be atrial “quadrigeminy”. There is slight (subtle) alteration in QRS morphology of these PACs. That is – the q wave of beat #3 in lead III is not as deep as it is for the 3 normally-conducted beats in this lead. The same holds true for the QRS of prematurely conducted beat #7 in lead aVF. We suspect this same phenomenon (slight alteration in QRS morphology) also occurs for beat #11 – although it is difficult to tell because beat #11 occurs just before the lead change … This interesting advanced concept is known as aberrant conduction – which sometimes is seen when a PAC occurs early enough in the cycle to fall within the relative refractory period (See ECG Blog #15). The QRS complex is wide (more than half a large box or ~0.11 second in lead V1). QRS morphology in the 3 key leads (I,V1,V6) is consistent with complete RBBB = Right Bundle Branch Block (See ECG Blog #3). Thus (as shown within the RED-BLACK rectangles in leads I,V1,V6 of Figure 2) – there is an rsR’ in lead V1, and wide, terminal S waves in leads I and V6 that satisfy criteria for RBBB. There is also LPHB (Left Posterior HemiBlock), making the conduction disturbance in Figure 2 a bifascicular block (RBBB plus LPHB). Because the posterior hemifascicle of the left bundle branch receives a dual blood supply and is much thicker than the anterior hemifascicle – LPHB is far less common than LAHB. The diagnosis is made by the finding of a disproportionately deep S wave in lead I (Figure 3) in a patient with underlying RBBB. Note that leads II and III show the opposite QRS pattern as lead I with LPHB (small q with tall R in leads II,III – vs small r with deep S in lead I ). The occurrence of bifascicular block with LPHB is often associated with more extensive underlying cardiac disease – and the inferior and lateral precordial Q waves seen on this tracing may be indicative of prior infarction in these areas. There is no chamber enlargement in Figure 2. Figure 3 – Schematic drawing of bifascicular blocks. LEFT – RBBB/LAHB, recognized by the net negative QRS deflection in lead II. This is by far the most common form of bifascicular block. to the S wave in lead I with tall qR complex in lead II. As noted above – there are small inferior and lateral precordial q waves of uncertain significance. Transition is early (with the tall R wave in lead V1 due to the RBBB). There are typical secondary ST-T wave changes of RBBB – with ST-T waves in the 3 key leads (I,V1,V6) being opposite the last QRS deflection in these leads as is expected with BBB (Secondary ST-T wave changes were explained in ECG Blog #3). Perhaps the most interesting part of this tracing lies with assessment of ST-T wave morphology for beat #8 in lead V3 and beat #12 in lead V4 (within the RED ovals). The ST segment is coved for both of these beats, with suggestion of ischemic-looking T wave inversion. However, there is resolution of these ST-T wave abnormalities in the beats that immediately follow (beats #9 and 13, within the BLUE ovals). At times – the normally-conducted beat following a PAC or PVC may show ST-T wave changes that are not seen on other sinus-conducted beats on the tracing. Whether such changes reflect underlying ischemia or not is uncertain. Thus, there is no evidence of acute ischemia or injury on this tracing with PACs and bifascicular block. SUMMARIZING THOUGHTS: This interesting 12-lead ECG obtained on an apparently asymptomatic 72-year-old woman shows underling sinus arrhythmia with PACs (some of which conduct with aberration). There is RBBB/LPHB (bifascicular block) – but no evidence of acute ST-T wave change (albeit with some alteration in ST-T wave morphology in the beat following PACs). This case provides an excellent illustration of the uncommonly encountered form of bifascicular block with LPHB – and – serves as a reminder of the importance of carefully scrutinizing QRS morphology of PACs, and ST-T wave morphology of the beat that follows the PAC. - Please check out our ECG Video on the Basics of BBB (www.bbbecg.com). Interpret the ECG shown below in Figure 1, obtained from a 50-year-old man with a history of longstanding hypertension. Is there is evidence of prior infarction? Figure 1 – 12-lead ECG from a patient with longstanding hypertension. Is there evidence of prior infarction? a deep Q wave (QS complex) in lead III. a subtle r’ in lead V1 with some concave upward J-point ST segment elevation in V1,V2. early transition between V1-to-V2 (with a surprisingly tall R wave already by lead V2). persistence of S waves throughout the precordial leads. IMPRESSION: The significance of the above findings that we note in our descriptive analysis is uncertain. Isolated Q waves (even when deep) are often found in leads III and/or aVF without necessarily implying that there has been prior inferior infarction (See below). Unless there are Q waves in each of the 3 inferior leads (II, III, and aVF) — we tend to interpret this finding as a “Q wave in lead III of uncertain significance”. A terminal r’ in lead V1 and persistence of S waves across the precordial leads are findings that are often associated with pulmonary disease — but the rest of this tracing is not suggestive of this. Slight J-point ST elevation with upward concavity in a few isolated anterior leads, but in the absence of other evidence of acute infarction is usually a benign finding. The most eye-catching finding on this tracing is the abrupt early transition caused by the unexpectedly tall R wave in lead V2. Possible reasons for this finding include posterior infarction, cardiomyopathy, abnormal body habitus, anatomic chest wall abnormality and/or lead misplacement. Clinical correlation (and comparison with a prior tracing) is essential to determine which of these possibilities may be operative. Leads with Normal Q Waves/T Wave Inversion: Five leads (III,aVR,aVL,aVF,V1) may normally display moderate-to-large Q waves and/or T wave inversion in otherwise healthy adults. Thinking of a “reverse Z” (à la Zorro) may help recall which leads these are (Figure 2). Figure 2 – Leads that may normally display large Q waves or T inversion. Small and narrow normal septal q waves will often be seen in one or more lateral leads (I,aVL,V4,V5,V6) in asymptomatic individuals without heart disease. In general we can ignore lead aVR (a Q and/or T inversion in aVR is not indicative of MI/ischemia). Isolated T wave inversion (or an isolated Q wave) in lead III, aVF or aVL (as in Figure 2) — is most likely not to reflect ischemia IF the QRS is also negative in these leads. But IF ischemia or infarction is present — then lead II (in addition to III and aVF) should also show a Q wave and/or T wave inversion. 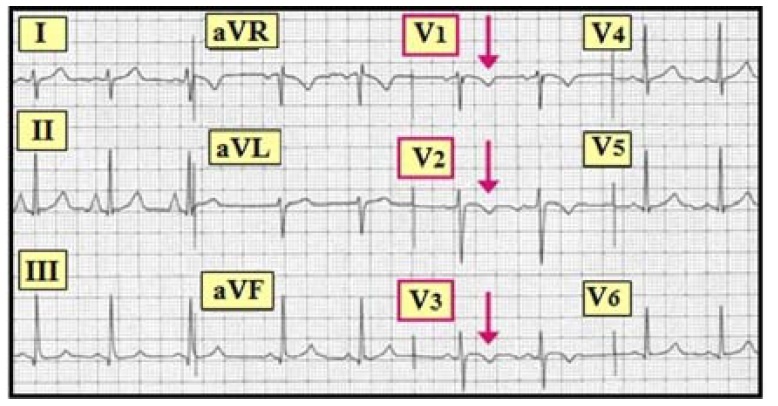 In adults — Lead V1 typically shows a QS or rS complex and T wave inversion. The QS may normally persist until V2 (but there should normally be at least some r wave by V3). In children — all bets are off! (children often manifest a Juvenile T wave variant in which there may normally be T wave inversion in leads V1-thru-V3,V4). Interpret the 12-lead ECG shown below in Figure 1, obtained from a patient who presented with new‑onset dyspnea. What two clinical diagnoses should come to mind in view of the symmetric T wave inversion seen in leads V1,V2,V3 (arrows)? Figure 1 – 12-lead ECG obtained from a patient with new-onset dyspnea. (Figure reproduced from ECG-2014-ePub). – NOTE – Enlarge by clicking on Figures – Right-Click to open in a separate window. INTERPRETATION: The mechanism of the rhythm is sinus, as upright P waves with a fixed PR interval precede each of the QRS complexes in lead II. The R-R interval varies — defining this as sinus arrhythmia. The PR, QRS and QT intervals are normal. There is RAD (Right Axis Deviation) of at least +100 degrees (predominantly negative S wave in lead I ). P waves are tall, peaked and pointed in lead II (≥2.5 mm tall) — consistent with RAA (Right Atrial Abnormality). QRST Changes: There are small q waves in the inferior and lateral precordial leads. R wave progression is normal, with transition occurring between leads V3-to-V4. T waves are fairly deep and symmetrically inverted in V1,V2,V3 (arrows). SUMMARY: Sinus arrhythmia. RAD. RAA. Symmetric T wave inversion consistent with anterior ischemia and/or right ventricular “strain”. IMPRESSION: Clinical correlation is essential to the interpretation of this tracing. Clearly, symmetric T wave inversion may reflect ischemia from coronary disease. Determination of whether or not this reflects an acute ECG change would require comparison with one or more prior tracings. It is important to appreciate that the constellation of findings on this tracing may also suggest RVH (Right Ventricular Hypertrophy) and/or right heart “strain”. ECG Diagnosis of RVH: Detection of right ventricular enlargement in adults by ECG criteria is often exceedingly difficult. This is because the left ventricle is normally so much larger and thicker than the right ventricle in adults — that it masks even moderate increases in right ventricular chamber size. As a result, many patients with RVH won’t be identified — IF assessment for chamber enlargement is limited to obtaining an ECG (an Echo is needed to know for sure). The ECG diagnosis of RVH is best thought of as a “detective diagnosis”. Rarely will any one finding clinch the diagnosis. Instead — the diagnosis of RVH is most often suspected when one sees a combination of the ECG findings shown in Table 1. This is especially true when several of these findings occur in a likely clinical setting (ie, COPD, right-sided heart failure, pulmonary hypertension). 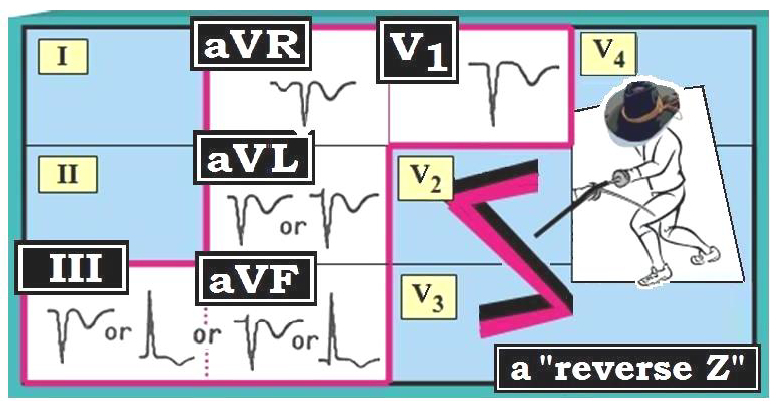 Table 1 – List of criteria that taken together suggest RVH (Figure reproduced from ECG-2014-ePub). There is sinus tachycardia (usually seen with large PE, albeit clearly nonspecific for the diagnosis). There are ≥2 signs of acute “right-heart” strain (ie, RAD – RAA – RBBB – tall R in V1 – deep S in V5,V6). There are ST-T wave changes of RV “strain” (ST-T depression in II, III, aVF and/or V1,V2,V3). There is new-onset A Fib (common with PE, but nonspecific). There are nonspecific ST-T wave changes (not diagnostic). CLINICAL IMPRESSION: The clinical context for the patient whose initial ECG is shown in Figure 1 is that of “new-onset dyspnea”. We do not know if the ECG changes seen in Figure 1 are new or old. Clearly — the anterior symmetric T wave inversion that is seen may reflect ischemia of uncertain duration. If the RAD and RAA are not new findings — they may reflect longstanding RVH from chronic pulmonary disease. But IF the RAD, RAA and anterior T wave inversion are all new findings occurring in association with new-onset dyspnea — then acute pulmonary embolus would have to be strongly considered. PEARL: Anterior T wave inversion may sometimes be an important ECG clue to the possibility of acute pulmonary embolus.